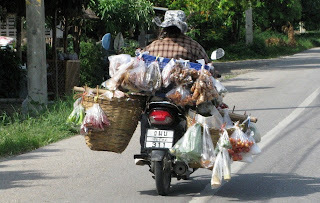 Thailand has a wonderfully rich and unique cultural heritage and it is famous around the world for its vibrant and colourful festivals. 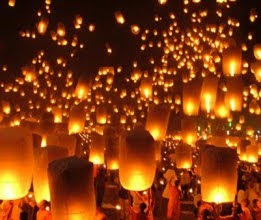 For me, the most striking and eagerly anticipated of these festivals is the annual, "Loy Krathong" or "Festival of Light". It is traditionally performed on the full moon night of the twelfth lunar month. For those of us using the Western Calendar, this usually means it is held during the first week of November. 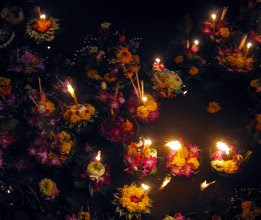 Unlike many Thai festivals, with their complex rituals and meanings which can often be difficult for foreigners to understand, the concept of Loy Krathong is very simple. coins, as well as candles and incense. 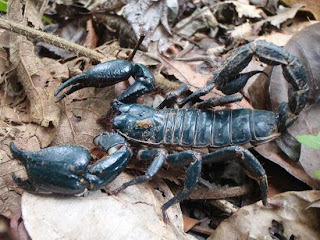 environmental damage and people are being encouraged to go back to natural materials. On the full moon night of the twelfth lunar month people will gather beside lakes, canals and rivers with their kratongs. They light the candles and joss sticks, make a wish and then place their kratongs in the water. The candle flame is said to signify fulfillment of wishes, a release from previous sins and long life. Being a romantic festival, couples who make a wish together on Loy Kratong are believed enjoy a happy future together. 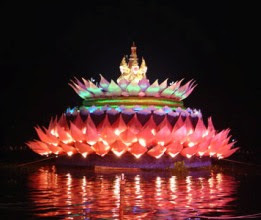 The orgins of Loy Krathong remain unclear and there are many legends surrounding the practice. Many believe it came into existence as a way of paying tribute to 'Phra Mae Kongka', the goddess of water. While others believe it has it origins in India, where devotees honoured a footprint of the Buddha, on the beach of the Narmaha River. Whatever the truth of its origins, Loy Kratong was first documented in the ancient Thai kingdom of Sukhothai, in the 13th century. Queen Nang Noppamas is reputed to have made a small boat to carry offerings of candles and incense. Today, it remains one of the most popular and endearing of all the Thai festivals and can be experienced nationwide, even in the smallest villages and hamlets. If you are planning a trip to Thailand, a visit during Loy Krathong is highly recommened, so you can experience the beauty and majesty for yourself.